I’m always up for a good repurposing project, so when I ran across these amazing things that you can do with bookcases, I had to share. What’s great about these is that you can buy old bookcases at most thrift stores or yard sales for just a few dollars each. So, if you don’t have a bookcase on hand, it won’t cost much to get one and you can do wonderful things with it! From headboards – who wouldn’t love a bookcase headboard? – to coffee tables and even some cool things for the kids, you can turn that bookcase into any number of beautiful new creations. Repurposing is seriously one of my favorite pastimes. I just love how you can take something and make it completely different – and in most cases so much better! I love the idea of turning old bookshelves into new things and if you have an old bookcase that is a bit worse for wear, you can restore it yourself before you repurpose it. Just take a look at this easy way to refinish wooden furniture. Then, you can turn that wooden bookshelf into something amazing and it will look as good as new. Not all of these projects are done with solid wood bookcases. 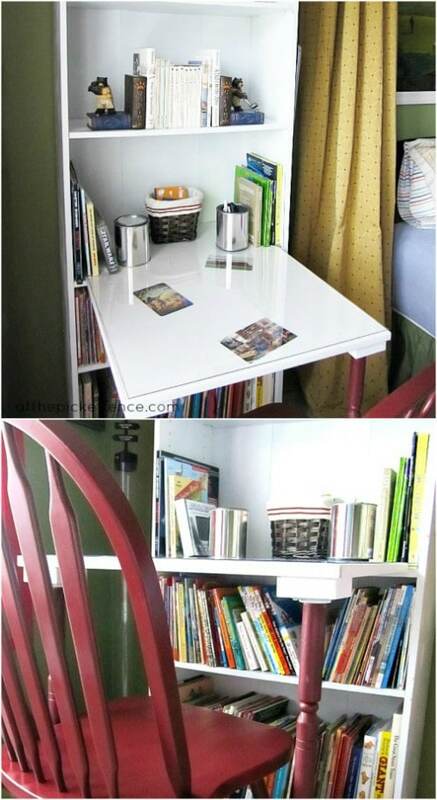 You can do many of them with those less expensive bookshelves that you find at Walmart and some of them are IKEA hacks. You know you love a good IKEA hack! So, whether you have an antique wooden bookcase or you have a cheaper one that you’ve just outgrown, you’re going to find some beautiful ways to put that bookcase to new use. And, just in case that bookcase or bookshelf you’re working with has drawers that you are no longer going to need, just check out these amazing repurposing ideas for old drawers. I really do love to repurpose and I adore the project ideas in this collection. Whether you’ve got one bookcase to repurpose or 20, I’ll show you some adorable and really functional ways to reuse them. Even if you don’t serve cocktails by the pool, this bar table made from an old bookcase is sure to come in handy somewhere around your home. And, it’s one of the easiest DIY projects ever. When you’re finished building it, you can spray paint it with a watered down gray paint and give it a really great barn wood look that is perfect for rustic farmhouse decorating. Turn that old bookcase into a beautiful headboard for the bedroom that gives you loads of storage and design. This bookcase headboard is made from an IKEA Expedit bookcase, although you could use any similar bookcase that you can find at a thrift store or yard sale. You just paint it to match your bedroom décor and then attach to a storage bed that you can also DIY. I simply love the look of this coffee table that is made with an upcycled bookcase. It’s just a standard wooden bookcase that you can get nearly anywhere – think thrift stores or flea markets for a really cheap one. The top is made from yardsticks and it’s absolutely gorgeous. It has a really nice farmhouse look to it with the rustic wooden yardsticks and the white bookcase bottom. If you don’t have an outdoor gardening space, a container garden is the perfect alternative. 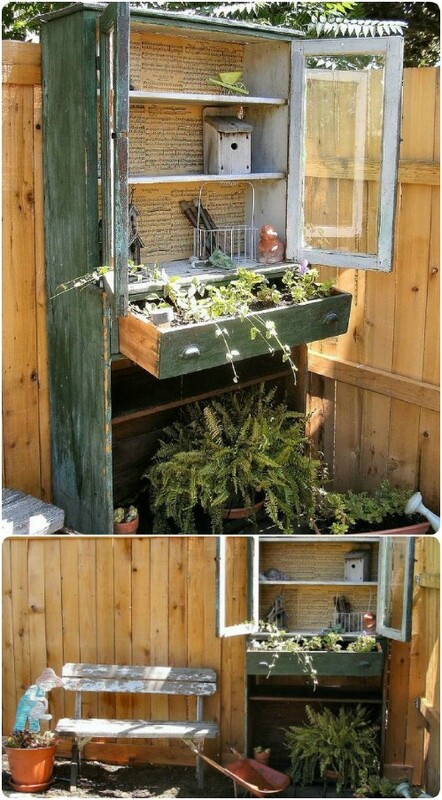 That being said, did you know that you can build that container garden out of an old bookcase? And, since there are sections in the bookcase, you can keep your veggies, flowers or herbs perfectly separated. 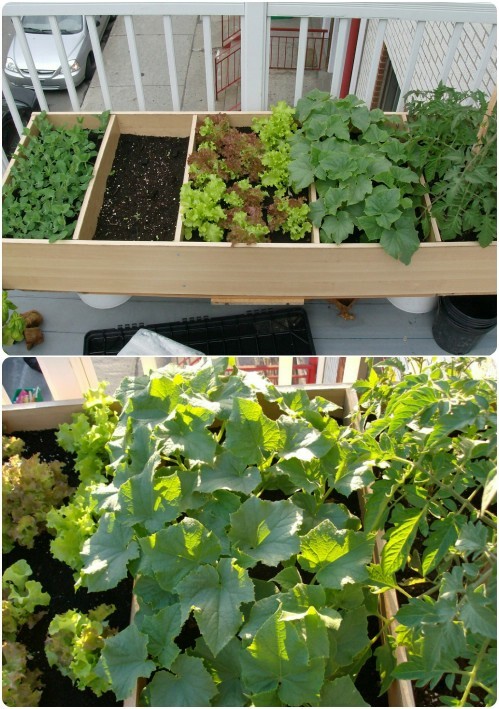 This is a wonderful idea for gardening on the patio or even the roof of an apartment building. 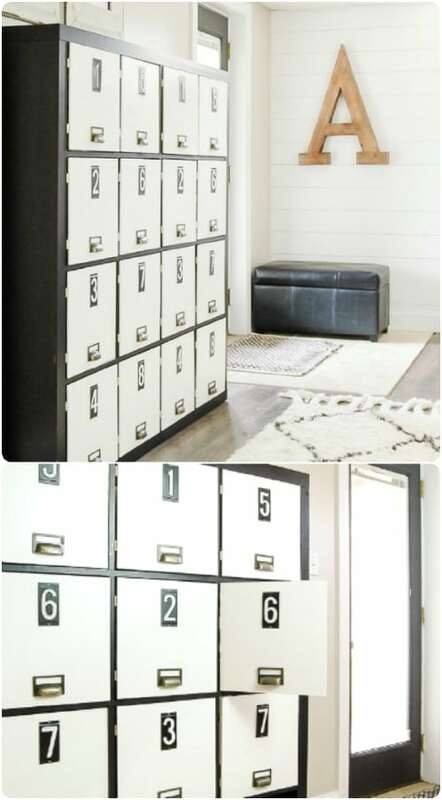 Lockers are a great concept for keeping things organized but who wants to shell out a small fortune to buy them? 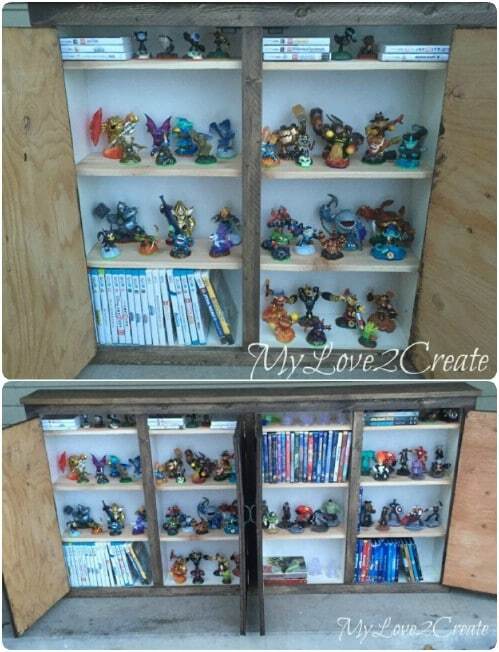 What if I told you that you could make them from an old bookcase? 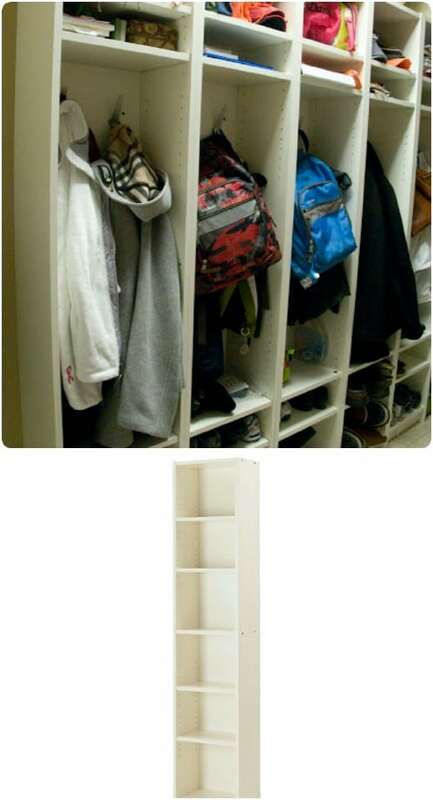 This DIY bookcase turned lockers project is brilliant and will help you to keep kids’ clothes, backpacks and so much more organized and neat. You make doors that pull open and you can put names or numbers on them so that it will be easy to find everything that you have stored. 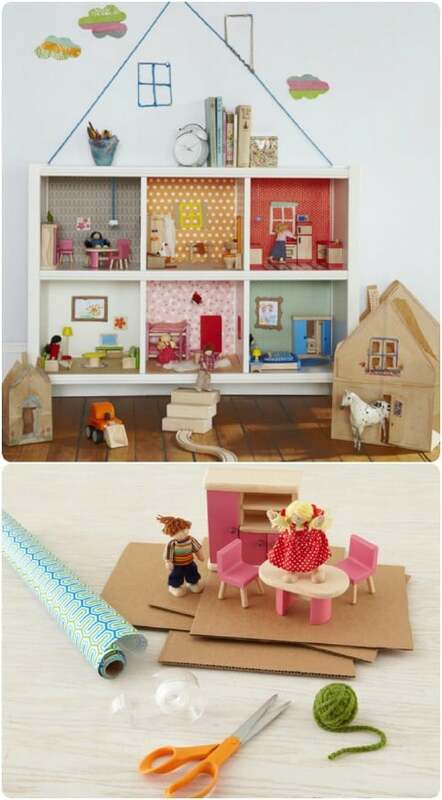 If you have an old bookcase that you simply don’t need any longer, you can turn it into the perfect dollhouse for your little ones. This one doesn’t even take a lot of work and it’s a lot cheaper than buying an actual dollhouse. You can use scrapbook or contact paper to create wallpaper for the different rooms and even add a roof if you want (Or just paint one on the wall). It’s got plenty of room for all her doll things and it’s so easy to customize. 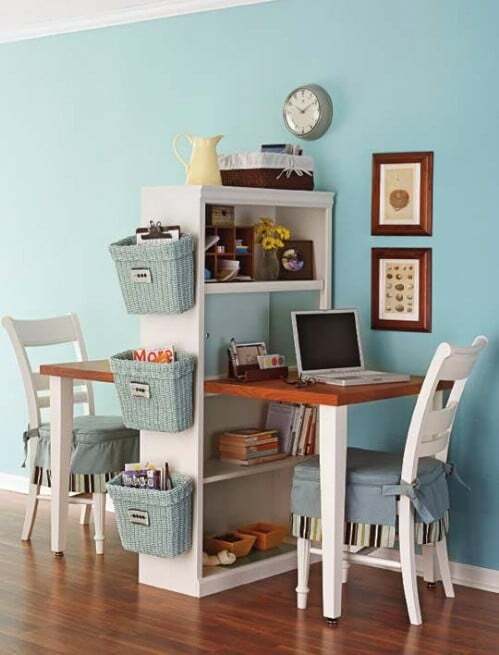 You can make not one but two desks and workstations out of just one bookcase! Imagine having a dedicated place for the kids to do their homework and a place where they’re actually separated so they’re not bothering each other while studying. This has so much organization potential and it’s such an easy little workstation to create. Just add baskets on the side and a couple of chairs and you’re all set. 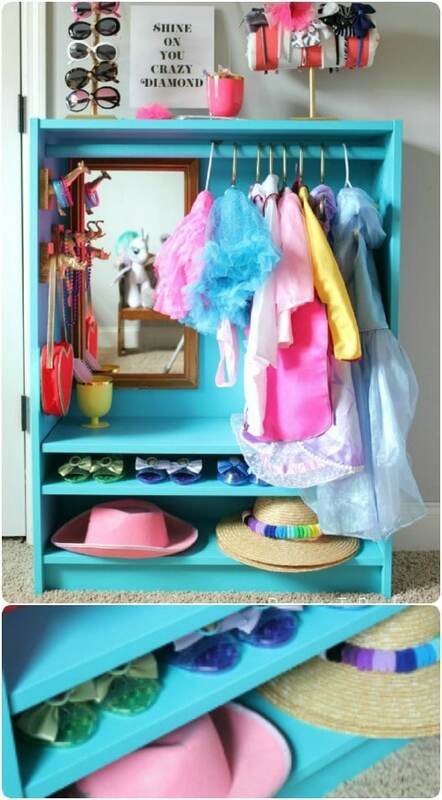 Build your little one the perfect dress up closet from that old unused bookcase. I love this and I promise that your little girls will love it, too. You could also do one for boys – just paint blue or red and turn it into a fire station changing room! Imagine the possibilities and you have the perfect place to keep all of those dress up clothes and accessories perfectly organized. Turn an old bookcase into the perfect place to store all of your garden tools, and with very little work. Not only does this give you a great space to store your tools, you can also decorate it with plants and flowers to add to your garden décor. A little paint and maybe some distressing to give it a nice rustic look and you’ve got a wonderful garden decoration that is as beautiful as it is functional. You can turn an ordinary IKEA bookcase into a beautiful kitchen island – and save a lot of money in doing so. Kitchen islands aren’t cheap by any means and making your own from an old bookcase is much easier than you may think. 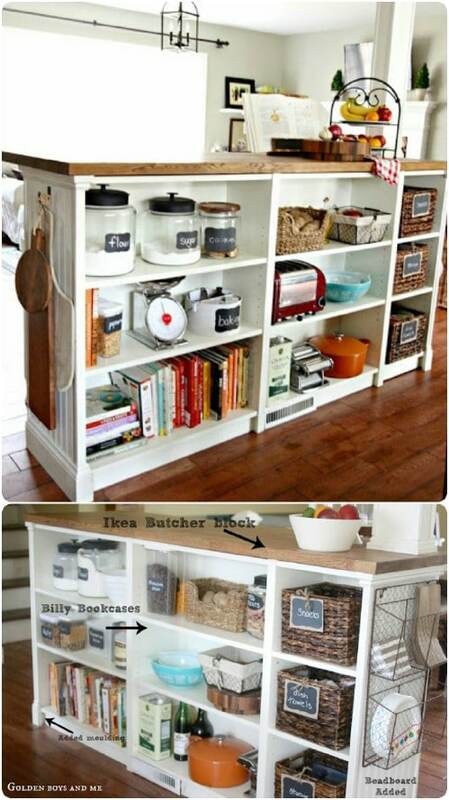 The shelves give you loads of storage space and you can cover the top with butcher’s block for a great kitchen look. Plus, when you paint the bookcase white and add the wooden butcher’s block, you get a great farmhouse piece for your kitchen. Kids do love their technology and this media cabinet that you make from an old bookcase helps them to keep it all organized. You could also use this for toys, but it’s perfect for video games and the like and it’s a pretty easy DIY project to complete. This one is done with drawers from an old dresser, but you can just as easily substitute an old bookcase and take away much of the work. Then just finish it off and you have the perfect storage for all that media. Turn that old bookcase into the perfect station for your mudroom. This also works well in the kitchen if you don’t have a mudroom and it will keep all of those outside clothes and shoes perfectly organized. It doesn’t even require much work. You may want to hang a few hooks for coats and scarves and maybe reposition the shelves if possible to make the cubbies the perfect size for shoes and coats. 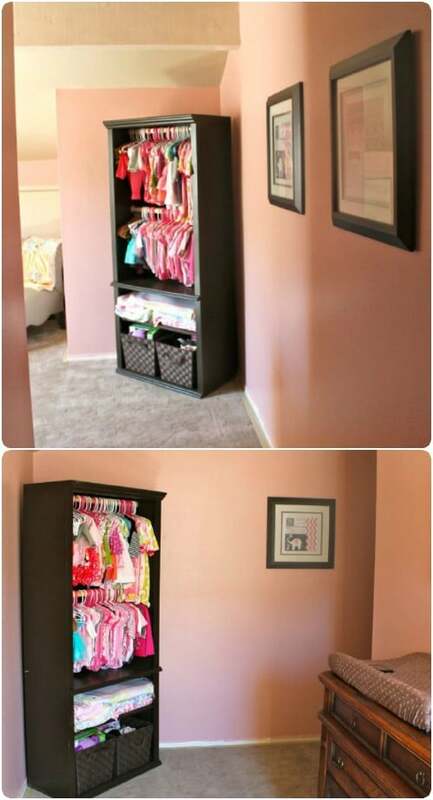 That bookcase that you don’t need for books can be turned into the perfect little closet for baby’s nursery. This is another project that really doesn’t require much work and it offers the perfect place to store all of those tiny little clothes. Paint or stain the bookcase if you want, to match the nursery theme and then just add a couple of closet hanging rods and maybe a few small baskets for holding tiny little shoes and socks. Turn a backroom or pantry into the perfect organized spot with an old bookcase – or two or three if you have room. Bookcases are great for helping you to organize everything in the pantry and since they already have shelves built in, you save yourself a lot of work as opposed to building all those shelves yourself. This one won’t even take you that much time. You can have that pantry perfectly organized din just a couple of hours from start to finish. Paint an old bookcase John Deere green and what do you have? You have the most adorable little play barn ever! And this also doubles as storage for all of those little farm toys. Add a little barn roof to your play barn to really give it character. If your boys don’t like John Deere green, you could also do this in red or paint it white or gray and distress it a bit so your barn looks weathered. Either way, they’re going to love it! 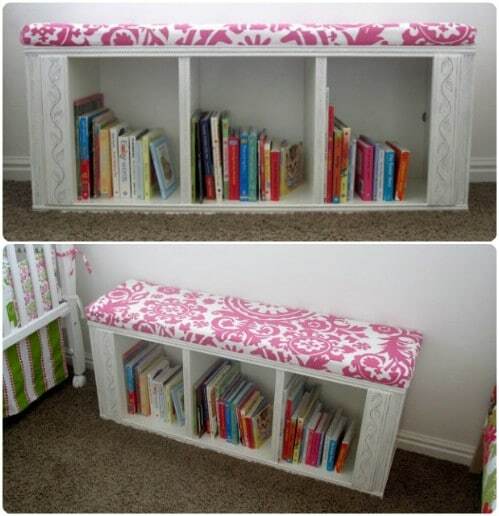 Here’s another wonderful way to turn an otherwise unused bookcase into something your kids will adore. This play kitchen is not at all difficult to build and it will cost you much less than anything similar that you can buy in stores. 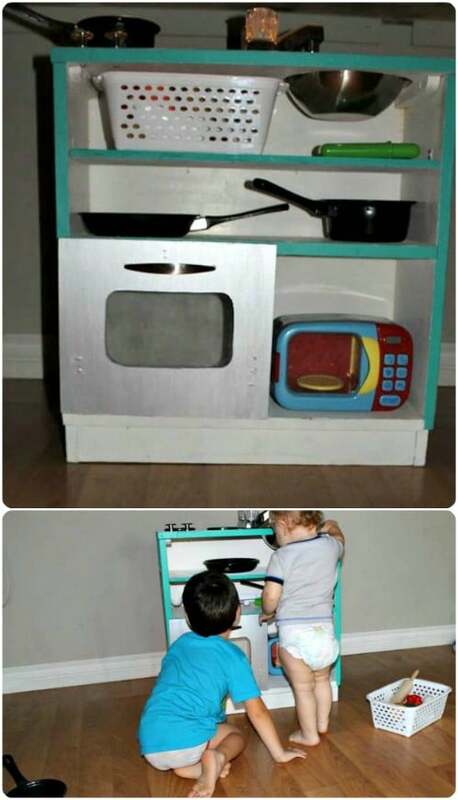 Years ago, I paid more than $100 for a play kitchen that wasn’t nearly as big as one you will get when you repurpose that bookcase. There’s so much potential to really customize it, too! 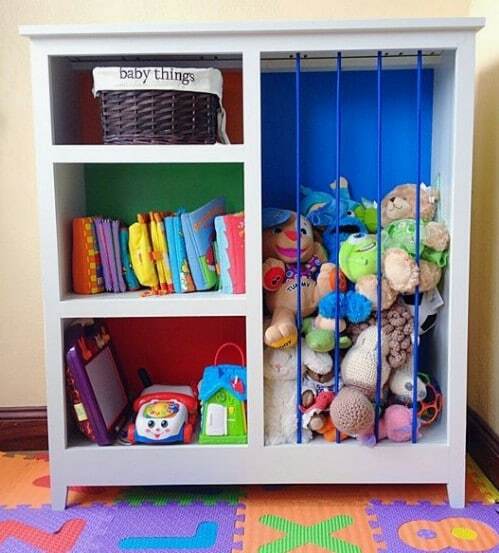 You can also turn that bookcase into a cute little pretend market for your little ones. This one is great for girls and boys alike and actually helps them to learn about money and other real life things. The only work involved is in adding the banner and roof. Other than that, the bookcase already gives you everything you need – unless you want to paint it, of course. Then add those adorable little plastic grocery items and let them have hours of fun playing market. I love this reading bench that’s made from an old bookcase. Not only does your bookcase continue to do its job of keeping your books organized, you can also actually sit on it to read. I really do love this entire project and it’s much easier than you may think. You can build a couple of these and fill an entire corner of your living room or bedroom. This would look amazing under a bay window! This bookcase turned craft storage is really great. Not only does it give you a place to store your fabric or other craft supplies, it rolls so you can stick it just about anywhere and get it out of the way. It’s really easy to make with a thin bookcase and some wheels and you will absolutely love the organization that it gives you. If you have room, you could do a couple of these side by side. 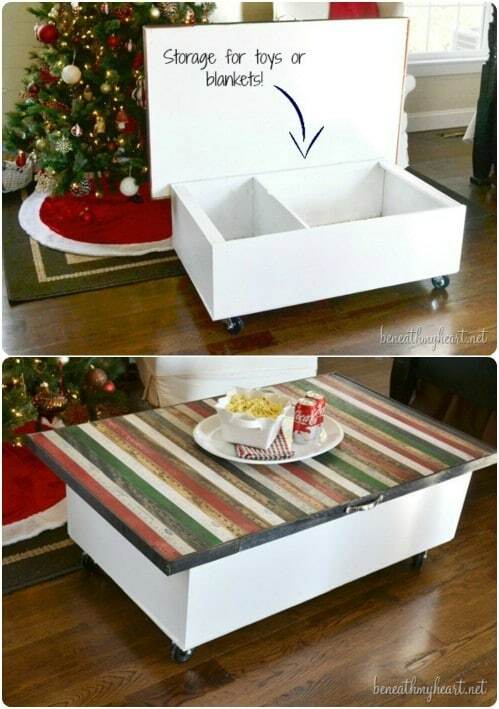 Just add handles and you’ve got all your craft supplies stored out of the way. Don’t you just love apothecary tables? I priced one at Pottery Barn a while back and they are super expensive. But, you can make one for next to nothing if you have a bookcase that you’re not using. The doors actually resemble those small drawers that doctors used for medicine back in the day, but instead of pulling out, they open up to reveal mass storage potential. 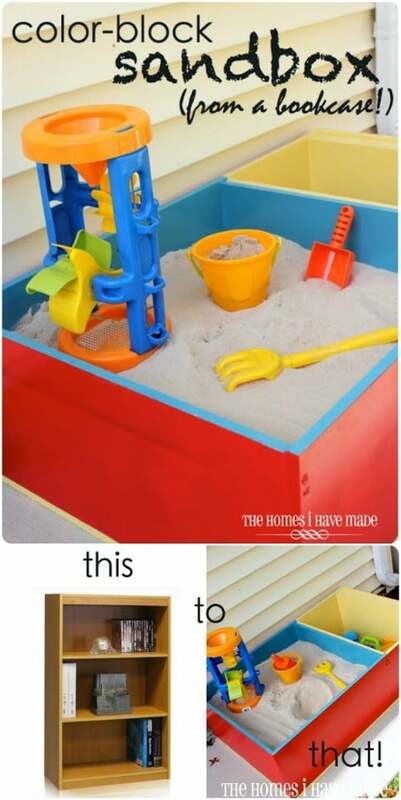 How much will your little ones adore this sandbox? Seriously, this is one of the most creative things I’ve ever seen that is made from an old bookcase. You just paint it with different colors and it’s perfect for sand play. Bookshelves that have removable shelving work best for this one as you can make the sandbox a bit larger in places. You can also divide it so that little ones have their very own tiny sandbox and aren’t getting in each other’s way when they play. This project is a build it all from start to finish but if you have a bookcase on hand that’s the right size, you can save yourself a lot of steps and just use that. The gist of the project is to hide away what’s behind door number one with a great bookcase that simply pivots out of the way when you need to access what’s behind it. 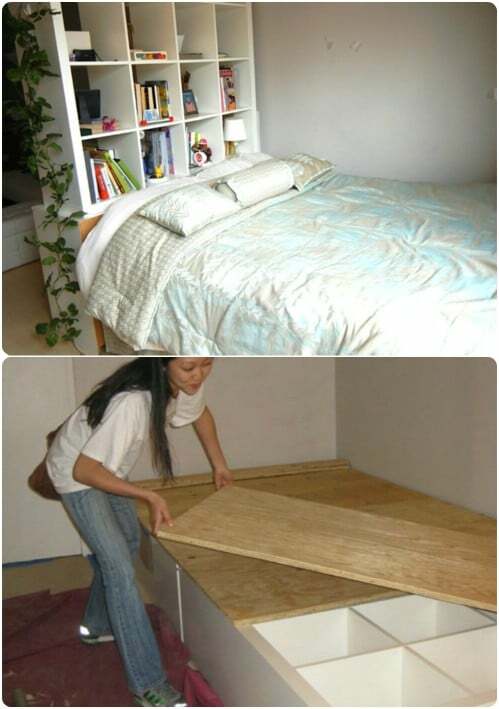 This is great for hiding away water heaters and other unsightly things and it’s a pretty easy solution to build. Turn that old bookcase into shoe storage! You know you never have enough storage room for your shoes (who does?). You can solve that problem by simply sitting a shelved bookcase in your closet on its side and sliding your shoes right in. 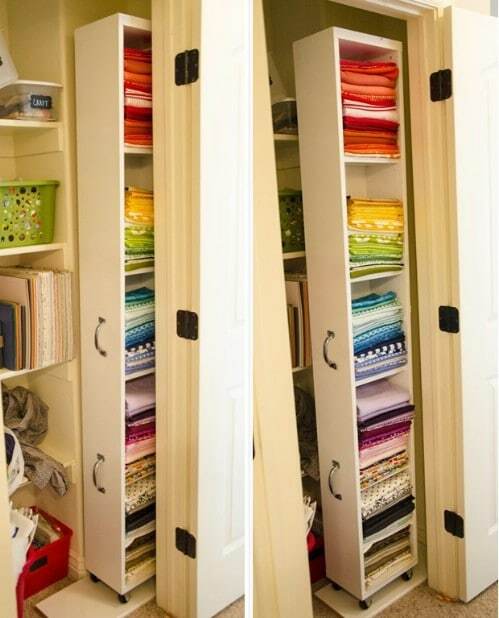 If your closet is big enough, you could do a couple of these – just stack them on top of each other to create the ultimate in shoe storage solutions! Or leave it standing upright if you don’t have the floor space to lay it down. 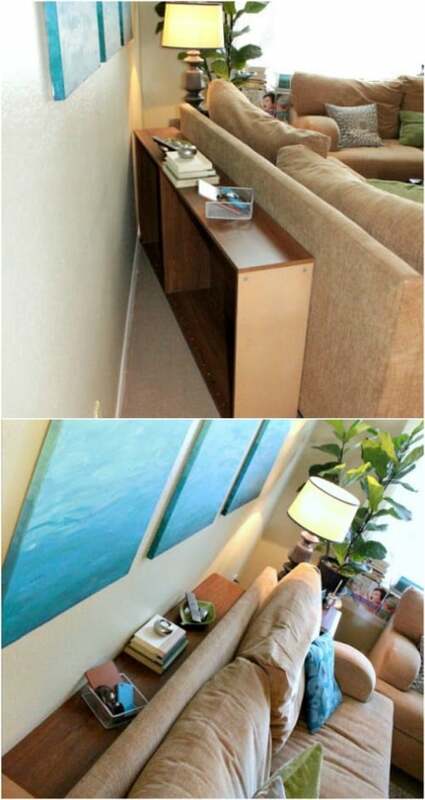 Turning a bookcase into a sofa table doesn’t require much work or time at all. You basically just turn it on its side and slide it behind your couch. This works best with a taller bookcase as you’ll want it to reach the same height – or close to the same height – as your couch. You can stain and distress it for a great farmhouse look or paint it whatever color you need to match your existing décor. There’s loads of storage and people will think you paid a fortune for your new sofa table! This toy storage from an old bookcase is borderline genius. Not only does it have room for loads of toys, the elastic bungees help to keep stuffed animals organized and off the floor. You can buy bungees at the Dollar Store for a couple of dollars – you get three or four – and that’s all you need aside from maybe some paint and a few baskets for smaller toy storage. If you need a new desk and you have an old bookcase on hand, your problems are solved. This upcycled bookcase desk is pretty easy to make and it’s really functional and has loads of storage space. We’ve seen the double desk but this one makes just one so you can sit it against the wall to save room. You just have to adjust your shelves where you need them and then add the pull down desktop and a chair and you’re all done. 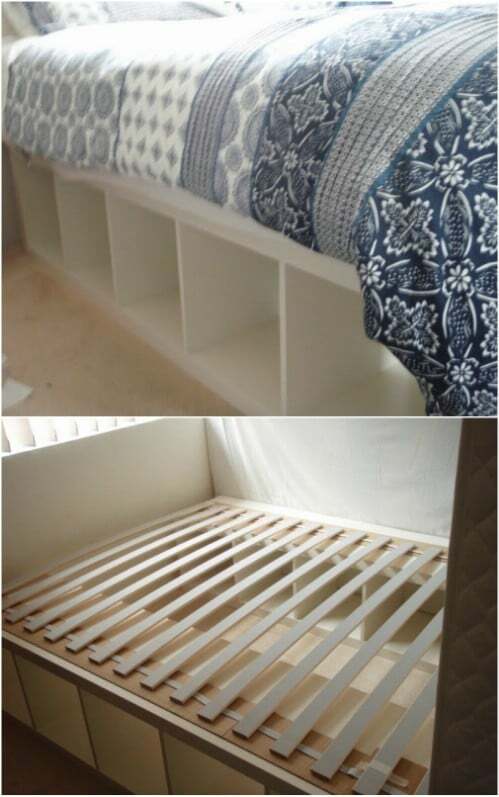 Not only does this IKEA hack serve as great under the bed storage, it serves as the bed frame itself! If you’ve ever wanted a bed frame that has a place for everything, this is it. You take an Expedit bookcase from IKEA and lay it on its side – do this for both sides of your bed or all three if you have a larger bed. Then lay your bed on it and you’ve got the perfect under bed storage and you’ve saved a bundle of money. Those storage beds are not cheap. This wine rack is a bit different than the wine cart but it’s still made from an old bookcase. 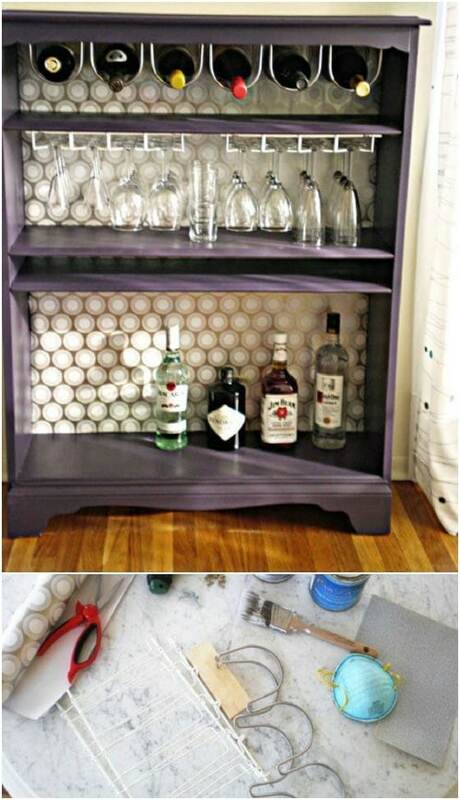 If you tend to have wine and/or wine glasses around the house, this is the perfect way to keep them organized. Plus, it’s really gorgeous when it’s finished and offers so much storage potential for all of your wine related items. Wine glass racks attach to the top of the shelf for hanging your glasses and bottle storage racks keep those wine bottles perfectly in place. You simply never have enough storage in the bathroom, right? 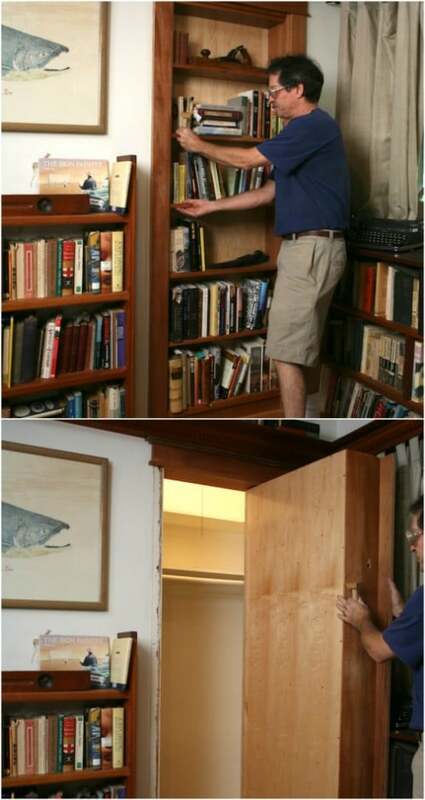 If you have the room and you have a small bookcase, you can easily solve that problem. Just paint the bookcase to match your bathroom décor, add wicker or canvas baskets and you’ve got the perfect place for keeping all those bathroom necessities perfectly organized. 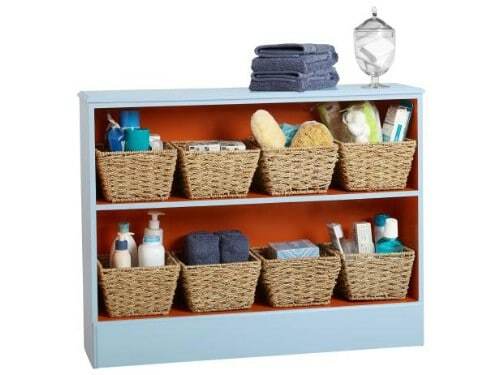 Add your makeup, toilet paper, towels, or anything else you need a place for. You can make so many things when you turn an old bookcase on its side. 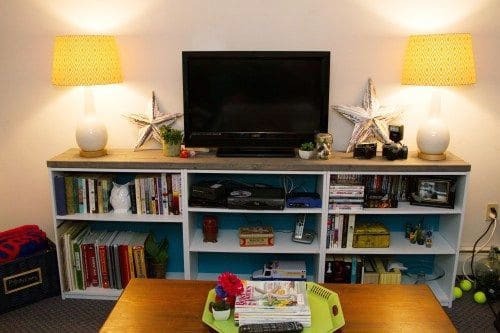 Take this TV stand for instance, it’s a simple project that only requires you to turn that bookcase over and maybe drill in a few holes in the back for cords. If your bookcase is backless, you don’t even have to do that! The shelving gives you so much room for storing video game systems, games, movies and so much more! Add a decorative wooden top to really dress it up.